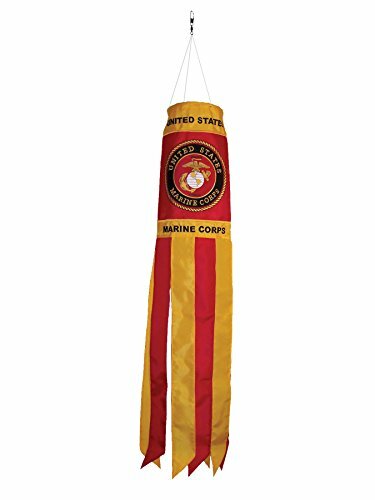 In The Breeze Item #4145 - 40-inch U.S. Marine Corps Emblem Windsock is made with durable polyester fabric that is stain, UV and weather resistant. The windsock body has a detailed U.S. Marine Corps Emblem that is appliqué, embroidered and printed. There are 8 coordinating streamer tails with sewn edges. The windsock size including tails is 6 inches in diameter and 40 inches long. A 3-position twisted polyester string bridle with heavy duty snap swivel is attached for easy hanging. In the Breeze Military Windsocks are officially licensed by the U.S. Marine Corps. It is one of the best quality windsocks you can find on the market. If you have any questions about this product by In the Breeze, contact us by completing and submitting the form below. If you are looking for a specif part number, please include it with your message.